Home › Education › What is Learning? I recently attended a cohort for MA students in organisational leadership and one of the subjects we were taught was “Teaching and Learning for Impact”. During one of the sessions we were split into groups of four and asked to come up with a definition of learning. I like what our group came up with, so have decided to share it with you. First, information is received. This could be in many different forms, such as through experience, reading a book, listening to a lecture or watching a video, etc. The assumption here is that there is some sort of input which we then absorb through our senses. Second, the information is processed and we develop some sort of understanding of the input. “Understanding” here does not mean I necessarily understood what was intended or what others may have understood – but that I have formed some sort of understanding of my own. Third, owning. We don’t always accept or agree with something we understand, or we may only partially accept something we have understood. For example, I either accept the premise that the world is round, or reject it. Either way I have absorbed, understood and made some sort of information my own. 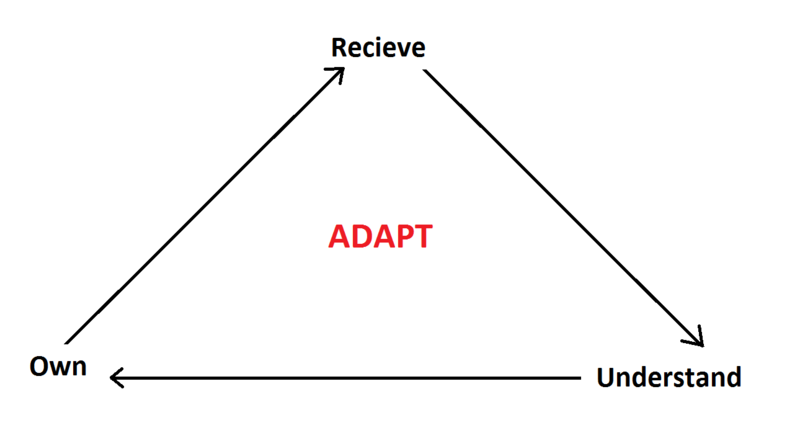 This all leads to the central effect of learning: Adaptation. Our thinking adapts to what we have learnt and in turn causes our behaviour to change. If we do not adapt, we have not learnt anything new. As I said, I like what we came up with, but credit has to be given to other groups who came up with impressive definitions of their own. Point being, none of us gave “right” or “true” answer, but all contributed to understanding what learning is. ‹ Are we doing education right?